It’s a win–win–win situation when Rory Penttinen, Rinaldi Racing and Nordic Lights team up in the Blancpain GT Series. The racing driver gets a better vision on the track, the racing team achieves better results and the world’s best producer of lights for heavy-duty vehicles gains new insights for making automotive innovations. – Behind the wheel the bad illumination drives you absolutely mad, but in my opinion racing teams haven’t so far put lighting very high up on the priority list, says Rory Penttinen. This weekend, 28–30 September 2018, he will drive his fifth race and finish his first season for Rinaldi Racing in the Blancpain GT Series at the Catalunya Circuit in Barcelona. His frustration over poor illumination peaked last year when he completed the Dubai 24h race. – During the hours of night racing the track is dark as in the grave and it feels like a totally different circuit, compared to daytime driving. The margins are extremely small in night racing and I will gladly take any advantage I get to improve the visibility on the track. Rory Penttinen and his team manager Marcus Jansson knew that Nordic Lights are experts on lighting up demanding conditions. Quite quickly they found the Nordic Lights product Scorpius, that could be integrated into the racing car and improve the night vision for the driver. – I need to see wide and far so I can react on time. It’s not the area right ahead of the car that is the crucial one. I used the new Scorpius lights in the races at Paul Ricard and Spa, both include night racing, and the difference was huge. The NORDIC LIGHTS® Scorpius was originally developed for an eighty-meter-high crane, that needs to be operable in all weathers. – Our industrial customers have very high demands and the illumination has to get through visual obstacles and endure hard conditions. Thanks to the Scorpius the crane operator can see in detail the people and the objects 80 meters below his feet, says Janne Lindholm at the Nordic Lights R&D-department. NORDIC LIGHTS® simulation with Scorpius wide flood and pencil beam on a Ferrari 488 GT3. Nordic Lights could also provide computer modelling and simulation for different light patterns. That convinced Rinaldi Racing to equip all the team’s Ferrari 488 GT3 cars with Scorpius lights. – The first time I used Nordic Lights I was so impressed with the illumination of the track. It was the very first time I was able to see the entry to Blanchimont! A super-fast left hander which is usually blind at night. However, for the first time it was almost as clear as day. A great product, says David Perel, PRO driver for Rinaldi Racing. So, Scorpius lights profoundly improved the long-distance illumination for night racing, but the Nordic Lights R&D-team is just getting started. The Ferrari 488 GT3 is lower than some of the other cars in the series, and that creates a bit of a problem when it comes to the position of the light source. – We have had some creative input from the Nordic Lights R&D-team and we will check if their ideas are possible to carry out. This is what happens when you talk to experts with different perspectives, people who think out of the box, says Rory Penttinen. In the Blancpain GT Series the cars and the equipment are strictly regulated, but when it comes to illumination the restrictions are less rigid. – You can practically have as much lighting as you want. Of course, it’s disturbing when you have reflections from chasing cars in the mirror, but every team tries to get the best possible lighting for their own drivers, says Rory Penttinen. Lights are also used for communication between drivers on the racing track. A blink with the lights from a chasing driver means that he wants to overtake. – A car with fresh tires can make several seconds faster laps”, says Rory Penttinen. When you are racing at high speed with sixty cars on the track, competitors tend to bump into each other or lose traction and spin off the race track. Most of the time they can continue the race, but they might have to go for a pit stop to change broken parts. – After I have seen how you at Nordic Lights test your products I have full confidence that the lights will hold for bumps, says Marcus Jansson. The tests that he is referring to are done at the Nordic Lights R&D–centre in the premises of the headquarters. The testings include vibrations, contact with different chemicals, shocks and variations in temperature from – 45 degrees C to + 85 degrees C.
– Some of our customers want us to stretch the tests to the point where the products actually break, explains Janne Lindholm. 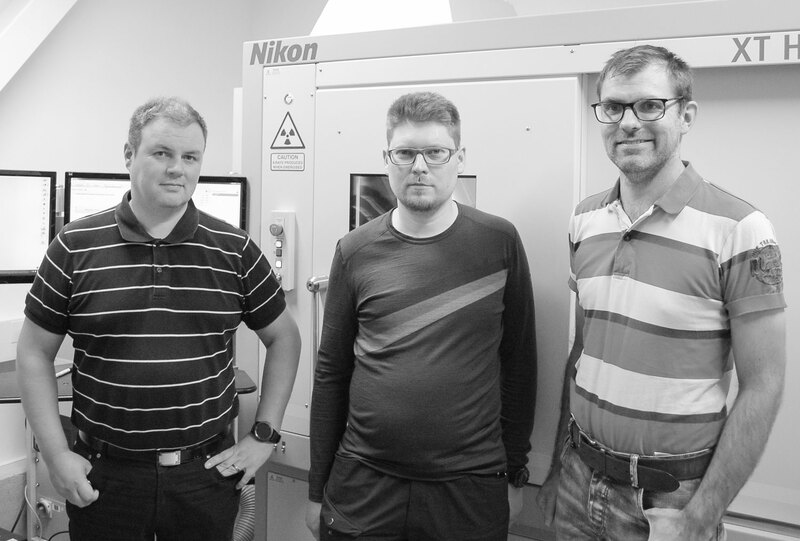 For product development and testing Janne Lindholm, Mikko Mäkitalo and Henrik Frilund at the Nordic Lights R&D team have access to highly advanced equipment, for example this CT scanner from Nikon. So, on Sunday, September 30th, 3 pm local time, Rory Penttinen will be at the starting line of the Catalunya Circuit. He knows every 4 655 meters of it and all of its 16 corners after hours and hours in his simulator. But there are always new obstacles and sixtyish other competing cars. Luckily, he has good illumination.